Halloween season is one of our favorites. It’s so much fun to help your kids find that perfect costume and watch them gleefully trick-or-treat throughout the neighborhood or collect candy at a party. As parents ourselves, we love to see our kids enjoying the spooky holiday that’s filled with ghosts and goblins, pumpkin carving, and caramel apples. The key to a fun Halloween begins with setting real expectations about your child’s candy consumption during this time of year. There’s no getting around all the sweet treats (and we wouldn’t ask you to do that!) but there are a few ways to enjoy all the delights of the holiday while helping to prevent tooth decay. Limit the frequency of candy intake. Instead of snacking throughout the day, allow your children to have a few pieces after lunch or dinner. Brush and floss your child’s teeth immediately after eating candy. If a toothbrush and floss aren’t available, rinse your kid’s mouth with water. Store candy in a place your kids can’t reach to keep them from having free range. Encourage your child to eat other treats instead of candy, like sweet fruit or even Xylitol candies and gum, which are delicious and sugar free! 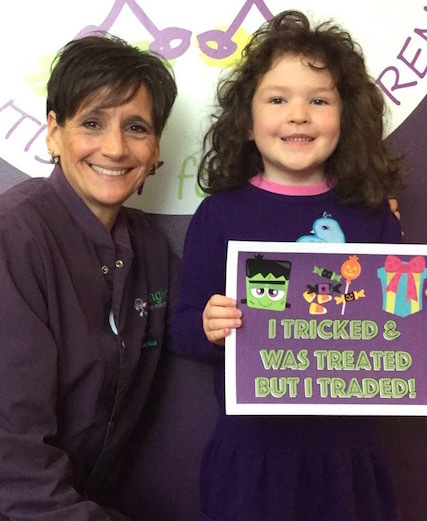 To help parents keep their kid’s teeth clean and sparkling, Behind the Smile also hosts an annual Halloween Candy Buy Back. It’s a tradition we’ve had for years that’s meant to provide an incentive for little ones to trade their stockpiled treats for cash. For every one pound of candy donated, we’ll give your child $1! This year, the buy back will be from November 1st through November 9th during normal office hours at both of our locations, in Amberglen and Murray Hill. Note: On Friday, November 3rd, we’ll only be buying back candy at the Murrayhill office in Beaverton. Our hours will be 8 a.m. to 1 p.m. We’d love to see you and your kids there! All candy purchased during the buy back will be donated to Operation Gratitude. The nonprofit organization sends the treats to U.S. troops serving overseas to lift spirits and remind soldiers of home. For this reason, we encourage children to write a letter or draw a picture to accompany the candy. We hope you’ll join our Halloween Candy Buy Back this year. We like to think of it as a win-win-win: it limits your child’s candy consumption, gets them excited about some cash to add to their piggy bank, and benefits the troops serving our country overseas. P.S. We promise your kids will love the cash as much as the candy they donated!